It has been proven that ticks can survive both the cold and warm seasons but they thrive more in the warmer months of the year. Summer definitely means it is tick season again and if you have wanted to go for natural tick control methods instead of resorting to chemicals, there are ways and means. Essentially though, whether natural or chemical tick control methods, the best first line of defense that you can take against the little blood suckers is prevention. It is always better than any treatment. That said, it is important to bathe your dog, your cat or any pet you have at home regularly. Vacuuming is another very important preventive step which should be diligently done once a week as well as a weekly washing of pet bedding in hot, soapy water. You also must regularly groom your pet that includes the usual hair trimming, ear cleaning and frequent fine-tooth combing. Despite all these, ticks could still manage to invade your homes so here is how you can control them without worrying about the harmful effects of chemicals. Apple cider vinegar solution spray – this makes a great natural anti-tick and a deodorizer spray at the same time. 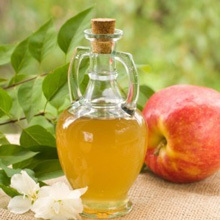 Simply mix equal amounts of apple cider vinegar and water and place in a clean spray bottle. Spray generously on your pet’s coat particularly on areas where ticks are likely to concentrate – the tail and the ear area. Be sure that no solution gets into your pet’s eyes. Natural eucalyptus, citronella or lavender oils – soak your dog’s leash, harness, collar, bandana or pet costumes in these scents that are known to repel ticks naturally. Let dry before use and repeat the procedure at least once weekly to maintain efficacy. D.E. powder (Diatomaceous earth) – is a natural tick control powder that is also effective against other pests such as bed bugs, cockroaches, fleas, etc. The powder has an abrasive touch that when sprinkled on pet’s beddings can help kill pests when they get in contact with the powder’s sharp edges. Ultrasonic parasite repellent device – this product comes as a dog collar or a pendant which you can attach on the collar. It works against fleas, ticks and other bugs by emitting ultrasonic pulses to keep parasites away thus preventing an infestation. Odorless and with non-hazardous components, the product is safe not only for the animals but for humans too. Citrus wipe – this is another natural tick control solution that is cheap and easy to prepare. In a tempered jar, cover quartered lemons with boiling water, let cool, cover and let the solution stand overnight. Use the solution to wipe your pets with or you may use it as spray. There are some suggestions about the use of garlic but some studies question the safety of excess use on pets. Instead of garlic, brewer’s yeast may prove to be a better option. Bugs will shy away from pets whose blood reek of it. Ticks are very tricky when it comes to finding their way into your homes, persistent to an unbelievable degree. Natural tick control is the safest way to go because most chemical treatments are highly concentrated and could only harm pets and humans. If your house is carpeted and you live in tick-infested areas, that carpeted section could become a favorite target as hideaway as well as other less-touched areas. So vacuum as often as possible and maintain a clean surrounding because keeping them away is only part of the battle. The reluctance to use chemicals is understandable especially if there are children at home but doubtlessly, ticks need to be controlled. You have to be consistent and assiduous enough in your fight against them. There are many natural tick control products on the market but carefully read through the contents to ensure that they are really natural. You can actually make your own if all else fails. You just need to do a little research.